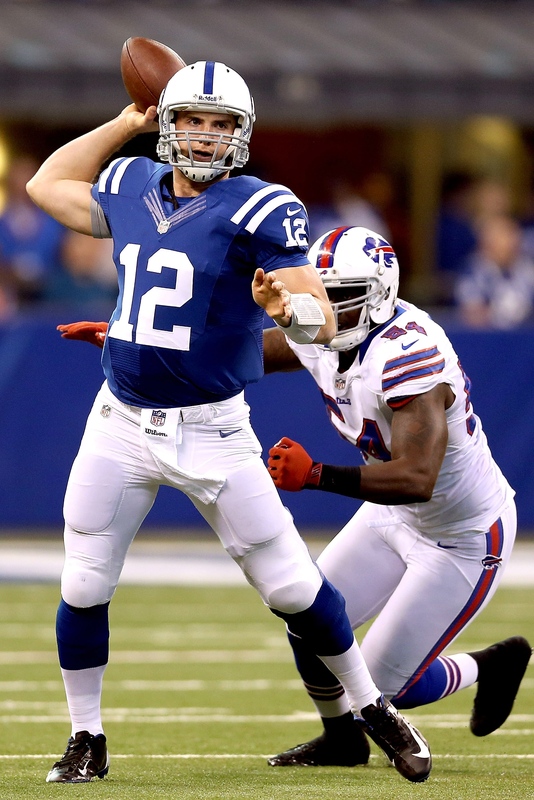 2013 Indianapolis Colts – Skill or Luck In First Season Under Andrew?? Not a bad first season in Indianapolis without Peyton Manning playing the lead at Lucas Oil Stadium. The light and sound stage that Andrew Luck commanded saw the most unlikely of scenarios that played out in the 2012 season. The Indianapolis Colts charged to an 11-5 record despite a Hall of Fame quarterback exiting stage left, first year Head Coach Chuck Pagano having to leave the team to battle Leukemia, which left interim coach Bruce Arians and top draft choice Andrew Luck to fend for themselves. Now a full year later we have to ask if the Colts will build on that success or take a step back. Normally we shouldn’t have to until you realize former Offensive Coordinator Bruce Arians is now the head coach of the Arizona Cardinals. His development of Luck along with astute play calling, was part of the reason they had 7 game winning drives. There was no head coach to interject or suggest a few things that could have disrupted the flow Arians and Luck developed. Although they brought in Pep Hamilton, his former offensive coordinator from Stanford, will it be as successful a relationship on the professional ranks?? We have to get through his growing pains as a first time NFL offensive coordinator. Andrew Luck avoids the rush to get off a pass against Buffalo. Quarterback: Has there ever been a quarterback who answered so many questions about being the number one selection?? Only a few The Chancellor can think of and many shared the spotlight during their 2012 rookie campaigns. For the season Luck connected on 339 of 627 passes for 4,374 yards, 23 touchdowns and 18 interceptions. Yet there is a growing feeling that a sophomore slump is imminent. The pendulum started to swing as the 2012 season was concluding. Over the second half of the season, defensive co-ordinators were drawing a bead on his tendencies and forcing him to pull the ball down more. He was sacked 41 times in 2012. Far too many…however they did sign Matt Hasselbeck if Luck was lost to injury.Without Arians, how will the in game adjustments be affected?? Especially those in the fourth quarter?? One theme that shows up is how he fared when he faced teams twice. When the Titans and Texans went against him a second time, his completion percentages were 47% and 50%. His maturation has to stay ahead of what he will see of opponents adjustments upcoming. Don’t forget this is a quarterback who is mobile. People overlook that. He did escape the pocket 62 times for 255 yards and 5 touchdowns. With the pressure the Colts took last year, roll-outs could be utilized to great effect although it shuts off half the field for a young signal caller. Luck will have a setback year that will leave him relegated to a rank of average as a quarterback. Year 3 or 4 will see him regain some of his top shelf play from a good rookie season. Offensive Backfield: Last year the Colts running by committee was to keep opposing defenses honest. Yet the inability to run the football may have been filled with the signing of former Giant Ahmad Bradshaw, just one week ago. Although in his sixth year, he has run for 1,000 yards in 2010 and 2012 while rushing for 4,232 yards during his career. More important is his 4.6 yards per carry where no Colt back had an average better than 3.9 yards. Bradshaw was a cap casualty in New York and should be the starter and upgrade this position to average. 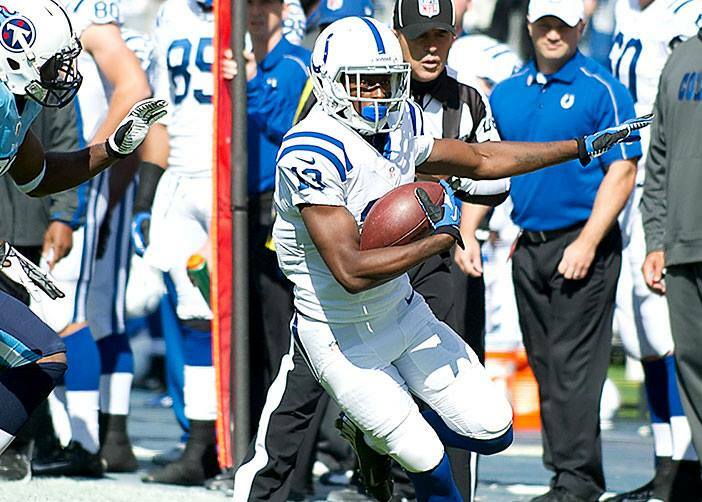 TY Hilton along with Ahmad Bradshaw will be Luck’s receivers to move the chains along with Wayne. Last year the Colts had success developing TY Hilton in the slot (50 rec./861 yds /7 TDs) alongside a veteran Donald Avery (60 rec / 781 yds /3TDs). Luck may have to lean on Hilton and his underneath receivers more this season. Hilton will see his reception total go up to 80-85 receptions this year. We don’t know if Hamilton will utilize the spread as Arians once did. Receivers will be average in 2013 based upon use and ability to score. An All Pac 12 performer that lasted until the 4th round. 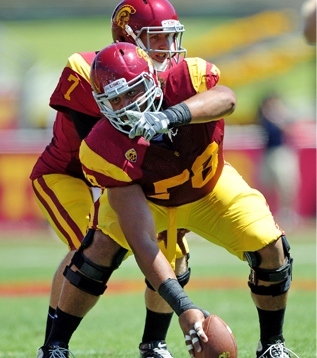 Khaled Holmes from USC. Offensive Line: This is the group Colts brass worried the most about. This line will have a new look now they drafted G Hugh Thornton of Illinois in the 3rd round and G Kahled Holmes from USC in the 4th. Holmes did play center for the Trojans for two of those years and offers some flexibility. He was an All Pac 12 performer and started 37 games for the Trojans. Both these guys will stick. Why?? They made some changes in the off-season but will it be enough to keep Andrew Luck upright. We already mentioned they were 23rd in sacks allowed with 41, but they were second to last in hits allowed on the quarterback with 116. If they do that again, Luck will miss some time in 2013. Thank goodness for Luck’s scrambling ability or he could have missed time last year. However this team needs a bit of a push in the running game as they were below league average with only 3.8 yards per carry. Toward the strong side the Colts were an anemic 38% in converting from the goal line or 3rd /4th and 2 or less. They had to revert to several quarterback draws to outfox defenses and they ran into a buzzsaw when they faced Baltimore in the playoffs. They couldn’t play heads up with such a physical defense and couldn’t score a touchdown. This will be a year of growth for this group and we have to wait into the summer to give them a grade as high as average up from bad. Defensive Line: When making a transition to the 3-4 from the 4-3 as this team did in 2012, you are going to experience some growing pains. One new assignment that will transition is the right defensive end. Where Dwight Freeney was the speed rusher from the blind-side, to a space eating combination DT/DE that holds ground and power rushes. Freeney, with 5 sacks last season, didn’t fit this new model and along with cap considerations has been released. Notice Fili Moala, Ricky Jean Francois, Aubrayo Franklin, and 5th round draft selection Montori Hughes are all defensive tackles acquired this off-season to fit this new team need. They need to be more stout up front as this team was 26th in yardage allowed and 31st in average yards per play given up at 6 yards per pop. This defense couldn’t get itself off the field in the playoff loss to Baltimore. They allowed a whopping 7.8 yards per play, 439 yards of offense, and 6 of 10 times the Ravens were able to convert 3rd downs. This was against a Raven offense that had yet to hit it’s stride. This group has to make more plays and rates as bad and we need to see more before we improve this ranking. Werner has to prove he wasn’t a reach in the 1st round after a disappointing combine. Linebackers: This is another group looking to make the leap from utilizing left over players to bonafide 3-4 linebackers. Former Packer OLB Eric Walden and Lawrence Sidbury were signed early on in free agency. The long armed Walden is versatile enough to rush the passer or clog intermediate lanes against the pass. 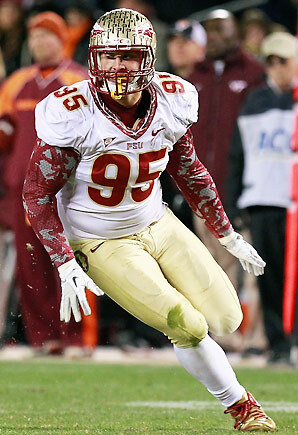 Then the Colts landed Bjoern Werner of Florida St in the 1st round of the draft. When you draft an All American who finished with 23.5 sacks for his career and voted ACC Player of the Year, you expect him to be on the field. He’ll probably rush from a down lineman position in this first year. There are some questions about him coming out of the combine but we’ll see. Incumbent OLB Jerrell Freeman (145 tackles / 2 sacks) may have to take an ILB position with all this competition and Robert Mathis (8 sacks) still in the fold. If the newcomers can provide the desired pass rush, Mathis can return to the strong side DE position as well. To improve on competition inside, the Colts traded for former Buffalo Bill Kelvin Sheppard. The Colts should see drastic improvements with all this reinforcement at linebacker. 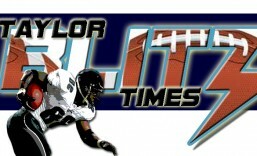 Taylor Blitz Times believes Werner will compete for AFC Rookie of the Year honors. The Colts have upgraded to playoff caliber with the assortment of talent brought in. Vontae Davis is a member of a secondary in transition. 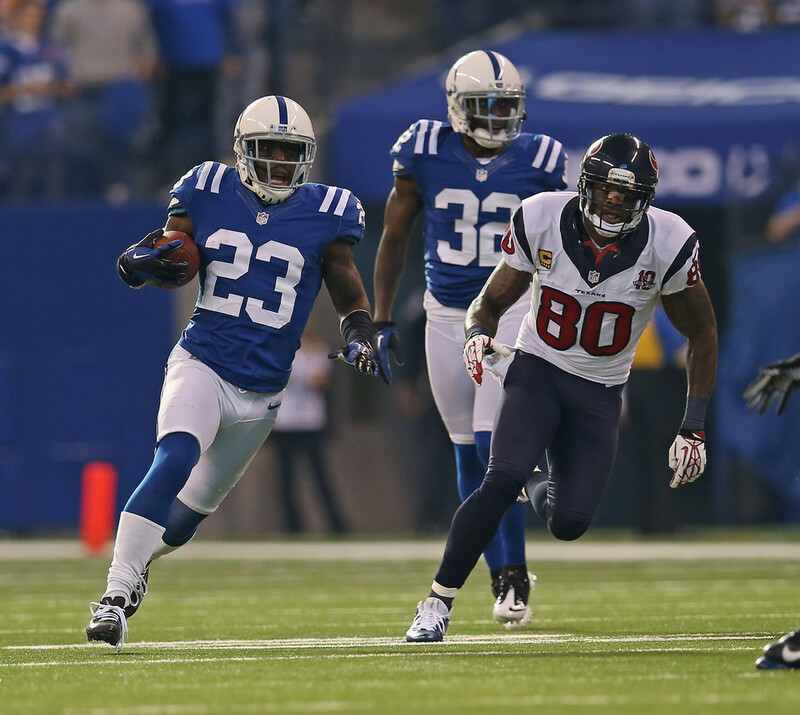 Secondary: One area the Colts wanted to improve was in the secondary. They signed free agent LaRon Landry to come in at safety and released Tom Zbikowski. Landry is a better pass defender and the Colts should move the sure tackling Antoine Bethea (100 tackles /0 ints/ 7passes defensed) to strong safety. However the Colts also selected S John Moyett in the 6th round. At corner they re-signed Darius Butler and Vontae Davis to return as an up and coming set of cornerbacks. In 2012, Butler returned 2 of his 4 interceptions for touchdowns and defensed nearly the same amount of passes (8) as Cassius Vaughn (9). Even though Vaughn started 10 games last year. Davis, the younger brother of 49er TE Vernon Davis, is a superior athlete with the tools to become a legitimate NFL star. A little focus and a pass rush can help get him there. Last year he had 51 total tackles, 3 interceptions, 8 passes defensed and one sack. He should be better with an improved pass rush and the secondary has a better center fielder in Landry. This group right now is average with a chance to upgrade this position this summer. Overall: One saving grace for the Colts is they play in a relatively weak AFC South. The Tennessee Titans and the Jacksonville Jaguars have yet to find themselves and have no identity. They are in a two team race between themselves and the Houston Texans. However they got by on spirit and having teams off kilter facing a team that was unknown from a personnel perspective. Arians could just let loose with his play calling since he wasn’t the head coach. The fact they were playing for a higher cause (coach Pagano battling Leukemia) allowed the 2012 Colts to soar to that 11-5 record. Now it’s about their X’s and O’s and ability to professionally be better than their opponent. Now with Pagano at the helm, expect a few more possessions to be called conservatively especially at the end of halves. Seven times they scored at the end of halves last year, where with a Head Coach thinking for the team overall won’t always be so aggressive with play calling. Last year they went 3-1 against the NFC North, where now they face the NFC West with defensive powers in Seattle, San Francisco, and Arizona. Now if you throw in the Rams, they are facing last year’s 4th, 3rd, 12th and 14th best defenses. All of those figure to be prominent with the Seahawks and 49ers having Super Bowl aspirations. There is a four game stretch where we’ll learn where they’re going in weeks 11-14. They travel to the Titans, then go to the Cardinals, host the Titans, then travel to Cincinnati. Last year they swept the Titans but they were blood baths with one of them an overtime win. Before they take on Houston who is the bully on the block. This team is going to be 8-8 this year if Luck is healthy the whole season. Things are worse if he goes down. When you have 9 games decided by 7 or less, a fickle bounce of the ball is the difference between being 8-8 or 12-4. Last year with Luck, pun intended, they were 11-5. With a first time NFL offensive coordinator, a second year quarterback who develped his play with a departed coach, and a look at this overall roster, this is a 6-10 team. However Andrew Luck is worth at least two more wins. 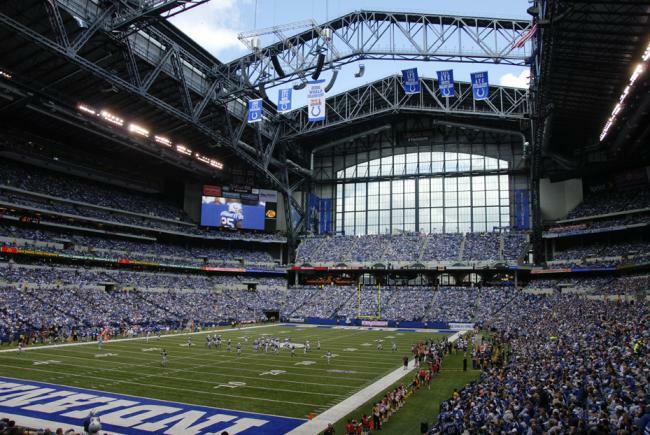 Expect growing pains in Indianapolis for the 2013 season. This entry was posted in 2013 Team Previews and tagged 2013 Colts Preview, Ahmad Bradshaw, Andrew Luck, Chuck Pagano, Indianapolis Colts, NFL, NFL Previews, Reggie Wayne. Bookmark the permalink.